This modern hotel reflects the high standards of service of the Hilton. Relax and unwind in the midst of green, sea and sand, especially when on a quiet holiday. Dubai International Airport is approximately 40Km from the complex. The deluxe rooms are equipped with marble bathroom, bathroom amenities, bathrobes, hairdryer, air conditioning, adjustable thermostat, television, DVD, telephone, high-speed internet access, safe deposit box, iron, iron board, tea and coffee making facilities, mini-bar and mini fridge. All rooms have a balcony and sea view. 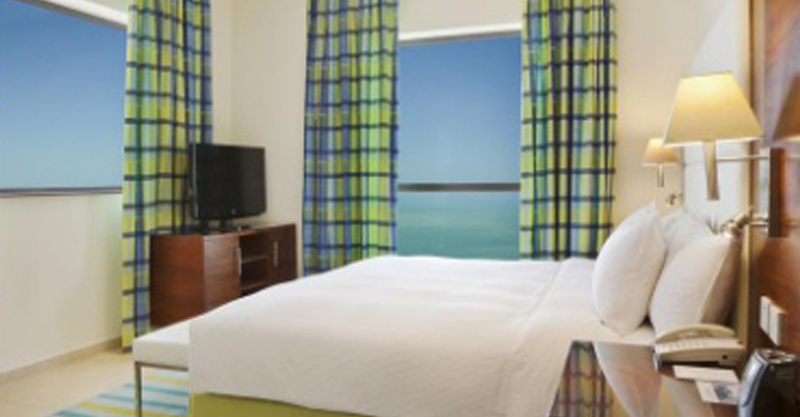 The Deluxe Rooms overlook the popular beach promenade, The Walk, with its cafes and boutiques. The 38m2 rooms offer high speed wireless internet (charges apply), a marble bathroom, a fluffy bathrobe and complimentary water and magazines. Upgrade to a Deluxe Plus room for stunning views of the Arabic Golf. Spoil yourself in a luxurious Suite, ranging from 69m²/742sq.ft to 204m²/2195sq.ft. Enjoy stunning sea views from the large windows or feel at home in the living room with seating area. The largest suites boast private dining facilities. Catch up on work at the desk, keep in touch with high-speed internet access (charges apply), or refresh in the marble bathroom. Guest staying in the Suites enjoy Executive benefits including complimentary breakfast and Executive Lounge access. Situated on the higher floors of the hotel the contemporary Executive rooms have views over “The Walk”. Executive guests are welcome to use the 9th floor Executive Lounge and enjoy complimentary breakfast, afternoon tea, evening drinks and canapés. 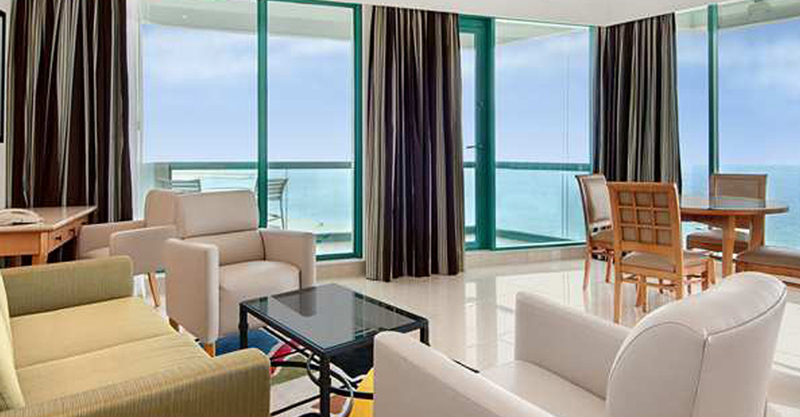 Upgrade to an Executive Plus room for stunning views over the Arabian Gulf. Taste award-winning Italian cuisine at BiCE Restaurant, or join us for salsa and tango lessons at Pachanga. 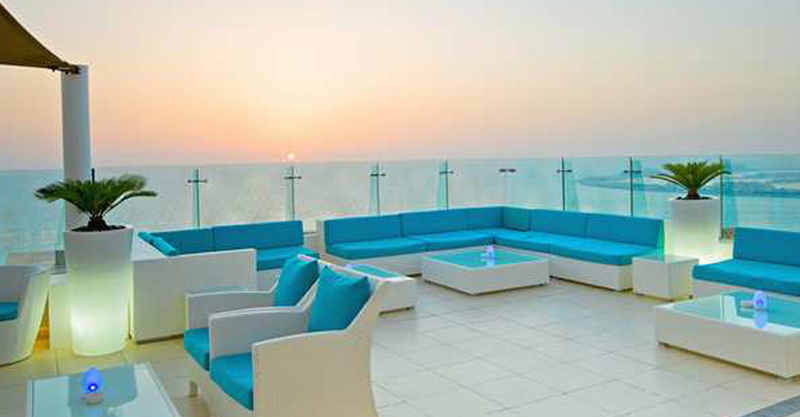 Dine alfresco near the beachside bar or enjoy live piano music at SKY Bar. At this Jumeirah hotel and resort you are spoilt for choice. The multi award-winning BiCE restaurant is famous for its mix of traditional and modern Italian dishes, making it a local hot spot. 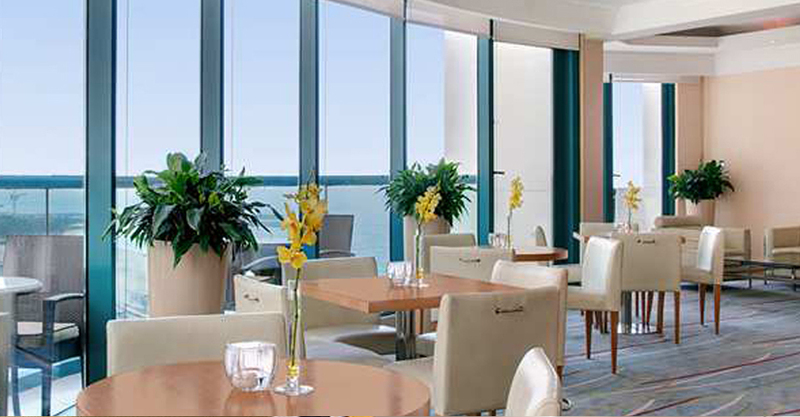 Two-tone floors and crisp white linen make this a favorite place to dine at the Hilton Dubai Jumeirah Resort. Try the classic Sicilian rigatoni or innovative dishes like lobster carpaccio at this popular Dubai restaurant – arguably one of the finest Italian restaurants in Dubai. Reminiscent of an elegant 1920s cruise ship, the lacquered wood interiors, tall plants and comfortable dining chairs give this Dubai restaurant a welcoming feel. You will be spoilt for choice with the daily themed dinners and breakfast buffets on offer at this Dubai restaurant. Savor the Dubai classic Friday brunch from 1pm-3:30pm. Relax in the shade of the beachside bar and enjoy juicy burgers, succulent jumbo prawns or home-made skewers, all prepared in front of you on the charcoal BBQ. For a special treat, try the fresh Canadian lobster cooked straight from the tank. Guests can watch selected sporting events on the plasma screens, play board games with friends and try a ‘hubbly bubbly’ from the Shisha Tent at the Hilton Dubai Jumeirah Resort. 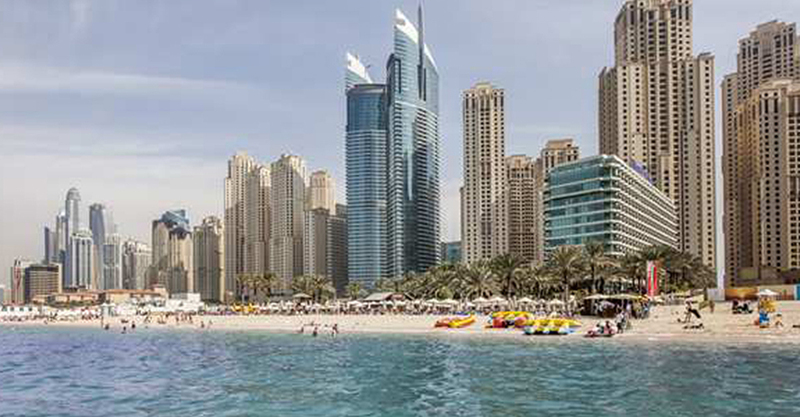 Located on the famous Jumeirah Beach with great views over Palm Jumeirah and the Arabian Gulf, Hilton Dubai Jumeirah Resort is only minutes away from world-class shopping including Mall of the Emirates, Dubai Marina Mall and Ibn Battuta Mall. Spend a lazy day at the private beach or at the outdoor pool. Take advantage of the special discounts at the Spa offered to in-house guests or dance the night away with Salsa and Tango lessons at Pachanga, the hotel’s South-American restaurant. • Passports endorsed British Citizen will be granted a visit visa on arrival in the UAE. Visas are valid for 30 days, with an extension of 30 days possible. • 220 and 240 volts, 50Hz. The most frequently used plugs are the square three-pin type. • Hepatitis A vaccination two weeks before travel and Diphtheria and Tetanus one day before travel is recommended. Medical care is excellent but expensive so insurance is essential.